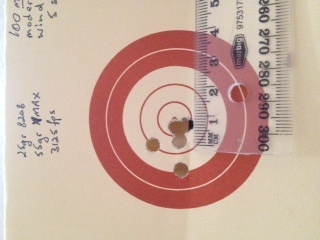 My .222 with 50 grn sierras comes close, when I do my bit correctly. I find the sierras very consistent in the 3 calibers I use them in. nice group Vince looks like you have got her sorted. 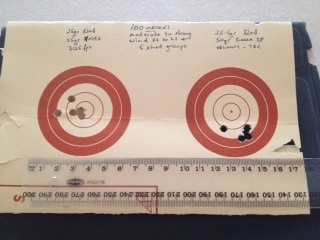 Yeah, I know Tiks, but I am lucky in that my shooting buddy has developed and been shooting .223 for many years and had an assortment of loads that suit his different rifles. His loads are very accurate because he has a Bench Rest background, the principles that he also applies to hunting loads. It makes sense to try his loads to see if my rifle likes the projectile powder combination and find out what works best. I am umming and ahhing about projectile weight, but I am leaning more towards a 55gr pill. As for powder...I am keen to keep my powder holdings to a minimum so I can load for all three calibres (.223 .243 30.30)with only one or two powders so to that end I am looking strongly at AR2208 and Benchmark 8208. I have a gut feeling that things are going to get tight here regarding availability of components because of tightened security after the "incident" in Melbourne the other day. The easier I can make it, the better chance I have of maintaining stocks of components. speer 50grn hps are very accurate for me cheap as chips and work well on game. in saying that I havent struck a bad projectile yet...most dramatic killer were 50 grn spsx hornadies. ....most dramatic killer were 50 grn spsx hornadies. I am finding that the Hornady projectiles are very accurate for me in both my .243 Win and the .223 Rem. 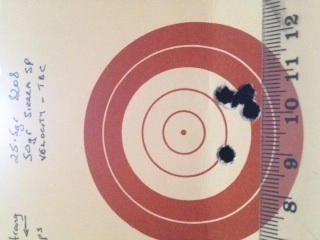 The 6mm projectiles in the 80gr range are getting hard to find, but the 55gr V-MAX in .224 are very readily available. I got a box of 250 yesterday for only $63, which is pretty close to the Hornady MSRP. I have a few different projectile weights for the .223 with the majority being 50gr and 55gr...these should meet all my needs...I hope. My mate and I had an impromptu range day last week (he got an unexpected day off work), so I decided to finalise some load development for my .223 Savage. We have bedded the action since our last range visit, so I was looking forward to see the results. It could have been a better day as the wind varied between moderate and strong blowing right to left across the range. Not a problem because this is a problem we encounter in the field as well. I decided on one powder, Benchmark 8208, and two different bullets, 50gr Sierra SP and 55gr Hornady VMAX. Things came together and after testing three loads for each bullet, I checked out the results. At the end of the day I have settled on 25.5gr of 8208 for the 50gr Sierra and 25gr of 8208 for the 55gr VMAX. given the wind, I'm happy with the groups below. Excellent results, Vince. It's rewarding to see groups like that. I may have to start looking for some 8208. Can't argue with results like that! Great job on the load!